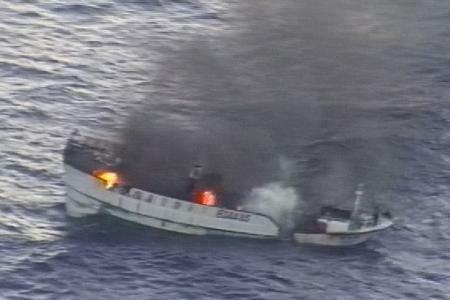 On Saturday, April 21, 2012 ten crewmembers were rescued from the burning vessel Hsin Man Chun, a 70-foot Taiwanese fishing vessel. The Coast Guard, U.S. Navy and Automated Mutual Assistance Vessel Rescue partners, coordinated in the rescue after the crewmembers were forced to abandon ship 700 miles west of Guam. AMVER, sponsored by the U.S. Coast Guard, is a unique, computer-based, and voluntary global ship reporting system used worldwide by search and rescue authorities to arrange for assistance to persons in distress at sea. With AMVER, rescue coordinators can identify participating ships in the area of distress and divert the best-suited ship or ships to respond. According to the US Coast Guard, more than 22,000 ships from about 100 countries participate in the program, the origins of which can be traced back to the sinking of the Titanic 100 years ago.